This is a Monero XMR trading update because the market has recently moved significantly in Feb 2016. Since most people probably have not heard of it this is a quick overview – Monero is an alternative currency (sometimes referred to as “coins”) with the most well-known being Bitcoin. In the last 2 years there have been many such coins created for a diversity of purposes. These new “coins” are the brave new world for cryptographic currency (“cryptocurrency”, or even “crypto”), but are still in the early adoption phase. One of the main selling points of Monero is that it can mathematically provable as truly anonymous, unlike Bitcoin with can be traced via the Block Chain. It is one of the foremost alternative crypto currencies that has actually survived long enough to potentially become a replacement for the well known Bitcoin (BTC). For some more background you can review our original investment from last year. 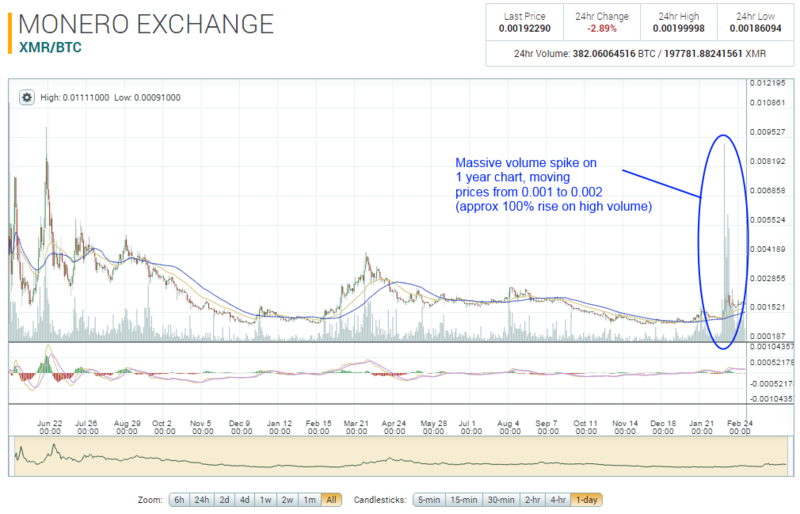 The following chart shows the price swings for Monero since inception, highlighting the recent move up in Feb 2016. You can track the real time price here. 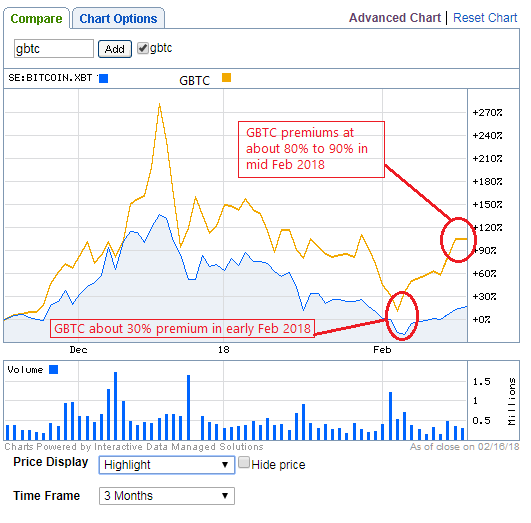 The following chart zooms in to show the significant volume move in Feb 2016 only. 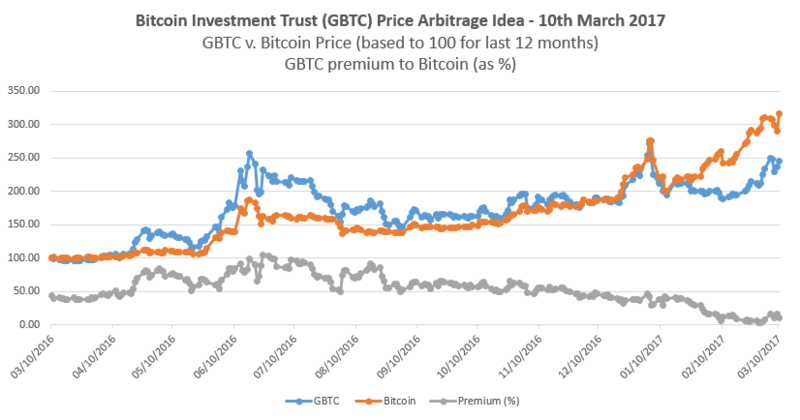 From a low of 0.0012 BTC to a high of 0.00246 BTC, with a current trading price of about 0.00194 BTC on 2nd March 2016. Please note the Monero XMR market is relatively illiquid and can be easily manipulated by people who already have sigificant XMR stash and wish to “paint the tape” showing large up or down price swings. 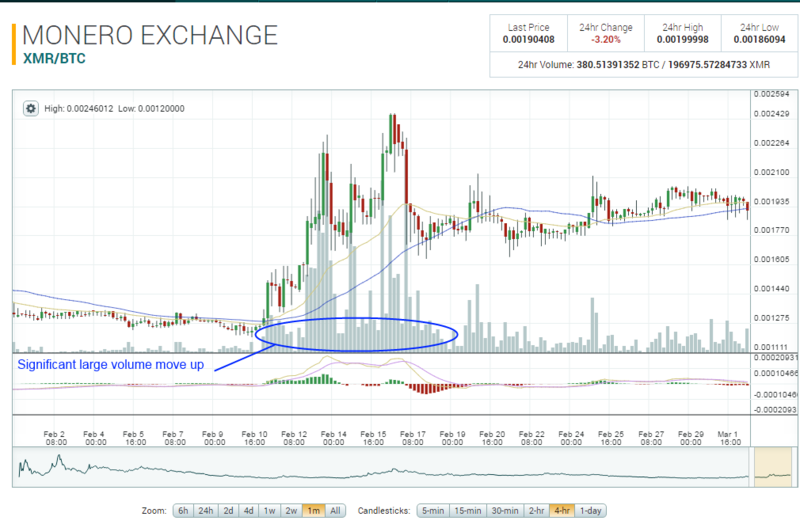 However this price move appears to be a significant move on large volume, therefore worthy of a trading update. Alternative currencies known as “coins” have received a lot of attention in the last few years, with the most well-known being Bitcoin. In the last 2 years there have been many such coins created for a diversity of purposes. Usability as a medium of exchange is one of the distinctive characteristics they have in common. These new coins are the brave new world for cryptographic currency (“cryptocurrency”, or even “crypto”), but are still in the early adoption phase. Adoption is both a critical measure and a crucial means of success for a medium of exchange. Confidence in the liquidity and fungibility of a currency is a crucial factor enabling adoption. The US dollar, for example, has wide spread adoption. Many worldwide markets transact with it. Consequently, governments and banks around the world keep US dollar reserves. Since World War II it has taken the place of the dominant global reserve currency. The US dollar has popular confidence, because the US government promises never to default on their debts. This promise is respected in part because it is easy to keep, as the US government can always issue more currency to pay those debts, since the dollar has not been backed by gold (a commodity with stable and finite supply) since 1971. The US Dollar is also seen as a store of value, and typically maintains relative price stability compared to other currencies. 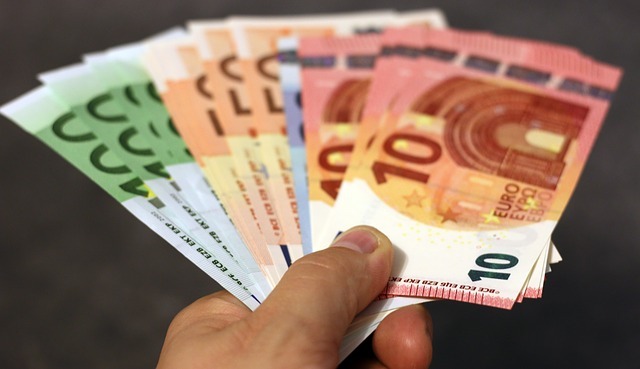 The example of the US Dollar illustrates what people what to see in a stable currency. This guide looks into one particular new crypto currency from this list of coins, and gives the investment case for investing in Monero (coin ticker symbol: XMR). We will consider how it may gain adoption, widespread confidence and become a store of value, potentially ultimately overtaking Bitcoin. Please note the terms “Monero” (the coin name) and “XMR” (the coin ticker) are used interchangeably to refer to the coin. Monero is one of the foremost alternative crypto currencies that has actually survived long enough to potentially become a replacement for the well known Bitcoin (BTC). 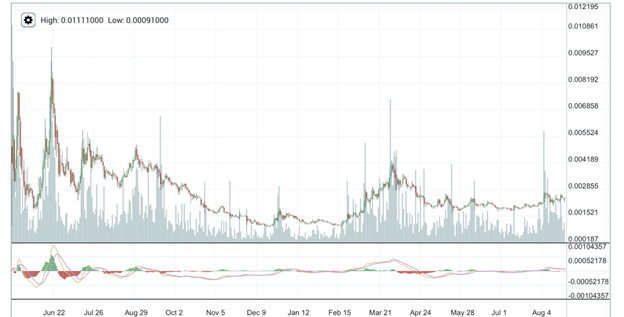 Monero has been in continuous operation since 16 April 2014. Initial miners began to offer it for sale on the bitcointalk.org forum directly thereafter. As many as 10000 XMR traded for 1 BTC in those earliest days. Because of the differences between Bitcoin and Monero protocols and programming interfaces, exchange platforms designed for Bitcoin clones would not work for Monero without extensive modification. 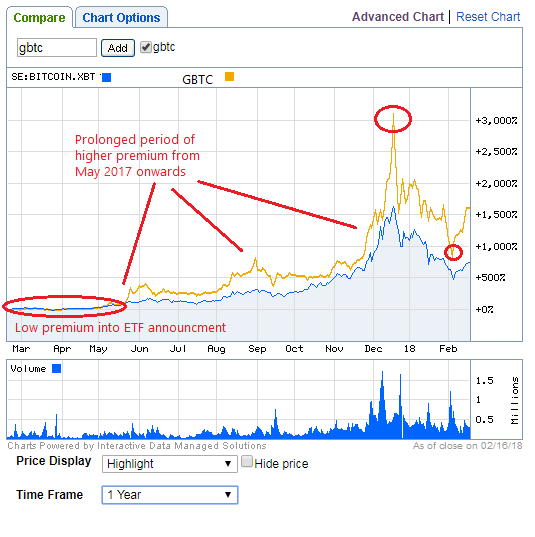 When poloniex.com offered a market denominated (as is typical) in Bitcoin, it became easy for Bitcoin holders to buy Monero, and that created an initial price bubble. One of the main selling points of Monero is that it can mathematically provable truly anonymous, unlike Bitcoin with can be traced via the Block Chain. If you are interested in learning more we have written an Amazon Kindle eBook Better than Bitcoin – A Beginners Guide to investing in Monero.